It should have been perfect, England’s most talented squad for over 30 years and a well-respected and well-travelled European coach who was the first manager to win the double in three countries. Untainted by domestic club politics, able to see a path to victory through a clear lens. What eventuated was a bizarre but frighteningly predictable and frustrating six years as Sven-Göran Eriksson came to England, guided the team through three tournaments and met, first hand, the sheer vulgarity of the English media. Qualifying for the FIFA World Cup 2002 pitted England against Germany, alongside Greece, Albania and Finland. Under the managerial guidance of Kevin Keegan; a man who would win the World Cup for determination and passion but was clearly lacking tactically, England would line up against Germany for both the stadium’s and Keegan’s last games. Keegan resigned immediately after the 1-0 defeat in the England dressing room, citing a lack of managerial ability for the highest level. The question of who would be England’s next manager brought forward familiar names, former under-21 coach Peter Taylor, John Gregory, Peter Reid and Bryan Robson. Howard Wilkinson, Technical Director at the FA, would take charge of England’s next game, away to Finland, just days after the Germany fiasco. Ray Parlour and Dennis Wise were two of the England starters that evening and the team sunk to the bottom of the group courtesy of a goalless draw. The World Cup in Japan and South Korea was about as far away as it was possible to be right now. Various parts of the media had ‘warned’ the FA about employing a foreign manager, who would have been the first ever to manage the England team. Former World Cup winner and Republic of Ireland manager Jack Charlton said the appointment of a foreigner would be “a recipe for disaster”. The FA had reportedly hoped Ottmar Hitzfeld, former UEFA Champions League winner with Borussia Dortmund, could be tempted to take the job. However, former Benfica and Sampdoria manager, Eriksson, was appointed. He had won the Coppa Italia, UEFA European Cup Winners Cup and the Serie A title with Lazio in 1999 and 2000 respectively, had an impressive CV and according to the FA he was the only manager who was considered for the job. A foreign manager of England doesn’t sound too outlandish now it has actually been embraced, but back in 2000, it was a different story. As expected the more right-leaning news publications incredulously branded the appointment as “selling our birthright” and “a humiliation”. The FA considered Eriksson’s appointment as a coup, while the fans were mixed, some welcomed a different direction while some were opposed from day one, these detractors would be the most vocal during Eriksson’s demise in 2006. A 3-0 victory over Spain in Eriksson’s first game eased the pressure somewhat, so did World Cup qualifying wins over Finland, Albania and Greece. A 4-0 friendly win over Mexico on a joyous, early summer Friday evening at Pride Park definitely stoked the honeymoon, feel-good factor Eriksson and the England team were enjoying. If there were any sceptics still around they were very quiet as England headed towards a revenge match in Munich, one which would all but seal England’s World Cup fate. We all know what happened on that rapturous night in Munich; Germany took the lead and had the better of the chances before the score became surreal. Michael Owen’s hattrick, Steven Gerrard’s game-changing, fierce shot in first-half injury time, even Emile Heskey scored. For Eriksson it would have been difficult to ever top this and even so early in his reign, it remained the high-water mark for Eriksson’s England. The momentum the Germany result generated carried England towards a showdown against Greece at Old Trafford, a point would guarantee England’s place in the 2002 finals. However, an extremely nervous and apprehensive England allowed Greece to take a first-half lead. The nerves were settled a little when Teddy Sheringham flicked in a header from David Beckham’s free kick. They had little time to settle before Greece took the lead again after some lightweight defending allowed Greece to go ahead again. England on the brink of elimination. From the highs of Munich, England had now been reduced to praying for a home draw against Greece. Up step Beckham. Vilified after his red card in St. Etienne three years earlier which had contributed to England’s World Cup defeat to Argentina, he took a deep breath as Old Trafford held theirs. He had one chance to banish the demons of 1998, Beckham took five steps forward and curled a simply perfect shot into the top left-hand corner. Pandemonium. England had qualified and Eriksson was rightly praised for turning around a hopeless team. April 2002 saw Eriksson’s private life become front-page news after claims he had an affair with TV presenter, Ulrika Jonsson. Whether it was true or not it was certainly a little undignified and no doubt pleased those in the media who didn’t want him as England manager. Not all news is good news for Eriksson; he and the FA could ill-afford any negative publicity so close to the World Cup. Unfortunately, this wouldn’t be the only time he would see his private life on the front page. England flew off to South Korea and Japan in high spirits, their demolition of Germany and subsequent qualification merely ramped up the expectations to a whole new level. They would be without one of their best players though as Gerrard missed out through injury. During the opening game against Sweden, the team looked tired and were seemingly content to see out the draw by the time Niclas Alexandersson levelled Sol Campbell’s first-half header, just before the hour. The same old flaws which had dogged England sides of the past, namely nerves and a lack of creative energy, we’re back again. It almost cost them their place in the tournament against Greece and now there was the small matter of a clash with old enemy, Argentina, on the horizon. It was hardly a classic, both teams desperately trying not to lose, although Argentina had the edge as they had won their opening game against Nigeria, so a win for England was all the more important. The only goal came from a Beckham penalty, won by Owen. Had it been at this year’s World Cup the fall/dive would probably have been described as “anticipating contact”. England exacted revenge for France 1998 and Mexico in 1986 and although this wasn’t a knockout game it was still no less gratifying. England progressed at the expense of their old rivals as they drew their final game against Nigeria in the sweltering temperatures of Osaka, while Argentina lost against Sweden. The undertone of a lack of charisma and laboured play hadn’t completely gone away, especially after the dull draw against Nigeria, but England had now made the last 16 and had only conceded one goal, in tournaments results are much more important than performances and Eriksson had passed the first test. Denmark were waiting next. The clinical and resolute way in which England dispatched the Danes, 3-0, was quietly one of England’s finest ever World Cup performances. Gone were the doubts over a lack of haste and the ability to exact a killer instinct, in a performance of proficiency akin to that of the quarter-final win over Sweden this summer, England were heading to a quarter-final meeting with Brazil on a high only matched by that of the euphoria following the victory over Germany. It was as devastatingly professional as England could have hoped for. The game against Brazil could realistically have been the Final and given the fact Turkey or Senegal awaited in the semi-final, the winners of the England/Brazil tie could have reasonably expected to make the Final itself. The game, like in Osaka against Nigeria, was played in blistering heat and England to their credit played the better of the two and went a goal up through Owen. Had they been able to hang on until halftime to rest the mind and body the game may have gone England’s way, but Brazil equalized in first-half injury time. A hammer blow. This Brazil side were mentally stronger than many of their counterparts over the years and they simply took advantage of a wilting England side. The winning goal is now famous, mainly for the “did he mean it?” debate. Ronaldinho’s free-kick evading the hapless Seaman and that was that England were broken and the two teams played out a subdued last half an hour. In the cold light of day England had only played well for one entire game and in parts of the others, the squad was as talented as any at the tournament, even without Gerrard and like 2018, the chance to win the World Cup had been within their grasp. Having said that, this competition was seen as a stepping stone to greater things in 2006 and Eriksson’s young squad had done well given the tough group. But 2002 also saw the first real criticism of Eriksson’s tactics as England had lacked any real drive in the second half against Brazil, many agreed a greater dynamism was required if they were to fulfil their potential. Seaman and Sheringham retired from international football after 2002 and the squad was enriched by the emergence of Frank Lampard, John Terry and Wayne Rooney. Rooney was handed his debut by Eriksson ahead of a friendly with Australia at Upton Park, at just 16 years old Rooney was England’s youngest debutant after a thrilling start to his professional career at Everton. After the rumblings of discontent around England’s lack of creativity and clinical edge, it was disappointing to see them have to come back from losing positions no less than five times during their Euro 2004 qualifying campaign. Qualification was secured away to Turkey at the end of a tense week where the country was distracted by events off the pitch as Rio Ferdinand, who would eventually be suspended for eight months and miss the 2004 tournament, missed a drugs test. England’s form leading up to the tournament followed a similar pattern, seemingly able to grind out decent performances but not really able to find the killer touch they had been looking for. A solitary win over Iceland, 6-1, was the only win between qualification and the tournament in Portugal. The pressure was also on Eriksson to form a stable midfield formation which utilised Paul Scholes, Frank Lampard and Steven Gerrard to their full potential and the key to unlocking this puzzle could be vital for England’s chances of bringing home trophy. The opening game defeat to the French was heartbreaking. England weren’t in danger of defeat but with the game heading into injury time, they conceded two goals, both courtesy of Zinedine Zidane. Beckham missed a second-half penalty, his second in successive competitive games after Lampard headed England in front. With arguably their most difficult game out of the way, England couldn’t afford any mistakes from the last two games to be certain of a quarter-final place. The game against Switzerland will long be remembered as the game when Rooney announced himself on the international stage; a bullet header from Owen’s chipped cross was met with an equally blithe cartwheel celebration. His second, a vicious low drive, hit the post and the head of diving Swiss goalkeeper, Jörg Stiel, before going in. A little fortune to it, but no less deserved. Rooney had led his country to the brink of the last eight and Gerrard capped the resounding win with a third with under ten minutes left. Rooney’s sublime performance was heralded across the country and the hysteria would become even more profound after the final group game, a 4-2 win over Croatia in Lisbon. Rooney scored two more goals, both taken with a real confidence and swagger, in a fine attacking performance by England. Despite falling behind early in the game Eriksson’s side displayed a genuine confidence as they ran out easy winners and set up a meeting with the hosts less than a week later. Owen flicked England into the lead after just three minutes, however, the self-doubt and the inability to press and kill teams off became more prominent as the game reached its conclusion. England were holding on and it came as no surprise when Helder Postiga levelled with under ten minutes remaining. Extra time beckoned, but there was one last act of drama as Sol Campbell turned in a rebound after Owen hit the crossbar and as the team and the country celebrated, Swiss referee, Urs Meier disallowed the goal for a foul by the goalscorer. Meier would go on to feel the full crassness of the English media as he reportedly received death threats after The Sun published his email address the day after the game. An entertaining extra time saw Rui Costa fire Portugal ahead before Lampard swept in the equaliser just five minutes later. It would be down to penalties to separate the teams. Beckham missed his third straight England penalty after he appeared to strike the pitch as opposed to the ball and it cleared the crossbar by some distance. After that miss, England surprisingly dispatched all of their penalties apart from one, as Darius Vassell joined that infamous club of players. There had been voices of disapproval over Eriksson’s approach and tactics after 2002 but he had been given some leeway as it was his maiden tournament, this time the media wouldn’t be so forgiving. Eriksson was heavily castigated for England’s lack of consistent quality throughout the tournament, in the two games, they lost they were literally penalised for not closing out the game much earlier, having been winning with less than ten minutes remaining in both. The question of exactly where Paul Scholes should play in midfield also came to a head. Eriksson clearly preferred Lampard and Gerrard in the middle and while playing all three in their natural position would surely lead to a change of tactics from his rigid 4-4-2, Eriksson persisted in playing his most talented midfielder on the left wing. Scholes, unexpectedly but not unsurprisingly, retired from England duty after the tournament, aged 29; the media concurred that a man of his undoubted talent shouldn’t be playing out of position. The manner of the exit from the tournament was particularly controversial and painful as was the post-mortem, however, Eriksson and the FA would face further scrutiny before the start of the next season. Eriksson was accused of having an affair with FA secretary, Faria Alam, and details were rather seedily exposed by The News of the World. Several FA employees were forced to resign, including Chief Executive, Mark Palios. Again, the salacious details of Eriksson’s private life were aired in public and a lot of good grace afforded by the decent tournament displays was rapidly depleting. Despite losing a two-goal lead in Austria and a shocking defeat to Northern Ireland in qualifying for the 2006 World Cup Eriksson’s side topped group six by a point from Poland and were rightly considered to be a semi-final contender. The 40th anniversary of England’s sole World Cup victory saw the finals being held in the backyard of their greatest rivals if the stars aligned this would be England’s most priceless ever victory. Eriksson made the front pages again in January 2006 as he became the victim of a ‘fake sheikh’ sting by a News of the World reporter posing as a wealthy Arab businessman who had told Eriksson of his plans to buy Aston Villa. Grainy secret camera footage captured Eriksson commenting on leaving the England job for Villa and on luring David Beckham away from Real Madrid. Added to this were remarks about Rooney’s temper, Ferdinand’s enthusiasm and Owen’s unhappiness at Newcastle United. The FA supported Eriksson and stated he had done nothing to breach the terms of his contract, but it would prove to be the last straw. Cynics suggested the FA would’ve been unable to afford to pay-off Eriksson if they sacked him anyway. The press, however, got their wish and just three weeks later the FA and Eriksson’s agent, Athole Still, agreed on a termination package and it was announced Eriksson would leave after the World Cup. Before the tournament began more controversy was just around the corner when Eriksson allowed the players’ wives and girlfriends, collectively known as WAGs, to stay with the team in Germany. Many saw their presence as an unnecessary distraction and it merely compounded the circus surrounding Eriksson’s England. The press saw it as ammunition to be used when Eriksson left after the finals. England’s progress through the group was a mundane as it was functional; an Eriksson trait. Seven points from three games was an excellent return, but only Rooney’s return from injury, Gerrard’s long-range effort to kill off Trinidad and Tobago and Joe Cole’s lavish volley against Sweden were the highlights of a dismally turgid trio of games. Yet, England had qualified and saw off Ecuador in Stuttgart courtesy of a Beckham free kick, that was the high point of another tense and prosaic game and serious questions were being asked of Eriksson’s capability to motivate the team to a more convincing victory when the opposition became more testing. 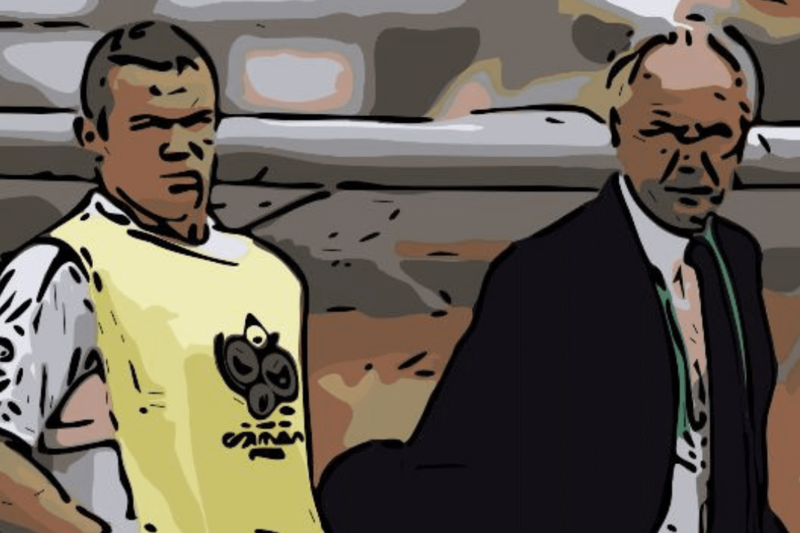 The quarter-final and what would be Eriksson’s last game in charge of England was against Luiz Felipe Scolari for the third successive tournament quarterfinal. Eriksson played Rooney in a lone striker role against Portugal but it merely compounded England’s lack of creativity as both sides slugged out a nervous and energy-sapping affair, Rooney’s red card just after the hour was the turning point of the game and penalties were as inevitable as England’s demise while taking them. Where 2004 was a low-key success, with five of seven penalties scored, 2006 was an abhorrent disaster; Owen Hargreaves was England’s lone scorer from four penalties and just like that Eriksson’s time in the England dugout was over. Eriksson’s reign is one which still divides opinions, however, the majority would argue given the talent at his disposal, not to mention an astronomical salary, England should have at least made one final. Those dissenters may feel differently had the manner in which England exited those three tournaments been in a more engaging and valiant manner. What we were treated to were, in the main, conservative and rigid tactics which did more to stifle the players than truly playing to their strengths. Scholes retired early, while Gerrard, Lampard, Stuart Downing and Joe Cole all played stints on the left of midfield; England’s Achilles heel. The lasting feeling of Eriksson’s team was that they were playing with the handbrake on, tournament games were often lacking in desire and several games were lost from a winning position. Portugal, France and even Brazil were not any better than England, certainly talent-wise at least, in the games they met during Eriksson’s stint, however, a distinct lack of confidence seared through the side during those games and Eriksson lacked the charisma to properly motivate the players to victory. Detractors would also be a little more forgiving if Eriksson had not made the front pages more than the back pages. The vulgar former Sunday publication the News of the World has to take some of the blame for the way they sought to bring down the England team when they most needed stability, namely before the three tournaments, but Eriksson was either genuinely clueless about the levels to which the English press would sink to in order to sell newspapers, or he was extremely feckless. In recent years he expressed his disdain for certain parts of the press in England, stating that his private life should be private. He is, of course, correct, but he has to take some of the blame for allowing himself to become caught up in scandalous news stories. The press also has to shoulder some responsibility for the unimaginable hyperbole which followed England to each tournament, had the expectations been tempered, similar to the way they were this summer, games may have been approached in a more relaxed and focused manner. Their constant hype and fanfare hardly helped the team during Eriksson’s time. Eriksson ultimately paved the way for Fabio Capello to become England manager in 2008, making it almost acceptable for a foreign manager to take charge of England and he only lost five competitive games as England manager. Yet, when we compare the giant strides made in just two years by Gareth Southgate, not to mention making a semi-final with England’s youngest ever tournament squad, one cannot help feeling that the FA and Eriksson let slip a golden opportunity. Genesis of Istanbul: Progress, But At What Cost?